Hello Fitness World! I know it's been a long time since I posted, I want to share with you a back and biceps workout that I did today at the gym. I am hoping to post more regularly from here on out! Last year was a big year for me of getting a promotion with my company, attempting to make gains working out, moving to Maui for a few months for work (while failing at getting my workouts in), and then moving back to my permanent home on Oahu. Fast-forwarded to now and I am getting ready to move again soon for a few months (destination TBA). I am really determined to make sure I don't slip up again on my workouts.....NO EXCUSES...I mean it this time! Could this be the year that I finally get my 6-pack? It will be hard, REAL HARD. It will take blood, sweat, and maybe even tears....but I believe I can do it. I've come so close, RIDICULOUSLY close, only to give up and regress. I am determined not to let that happen again. On top of this 6-pack goal, I'm considering competing in a bikini competition, but keep going back and forth on my decision. Some of my friends have had bad experiences from it while others absolutely love it. If anyone reading this has thoughts on the matter, please let me know in the comments below. I would love to hear different opinions and experiences from girls (or guys) that have competed or are thinking of competing....hmmm. Since being back on Oahu I've made a lot of progress with building my strength, I can do things that I could NEVER do before. The highlight of my year so far is being able to do 10 Pull-ups unassisted! 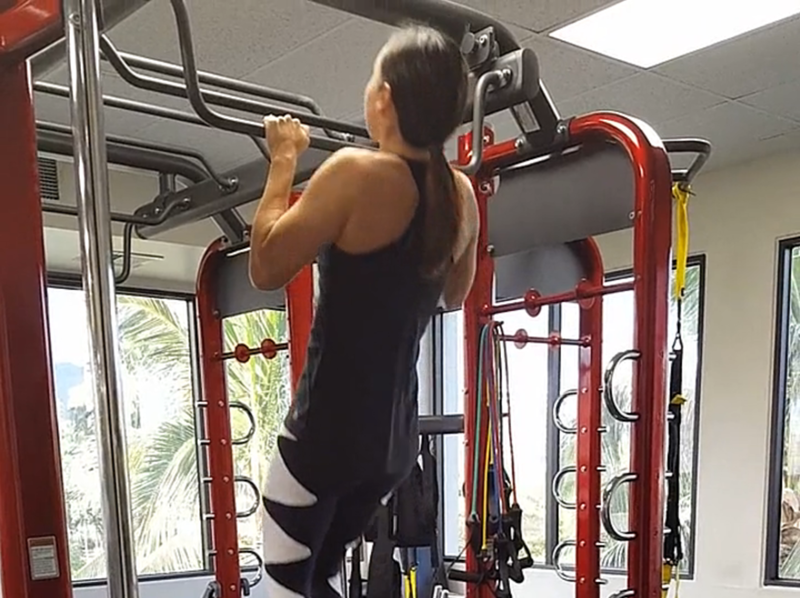 When I first started attempting to do pull-ups, I could only do 2. Now on a good day I can do 2 solid sets of 10 pull-ups! What happens when you stop eating sugar for one year?